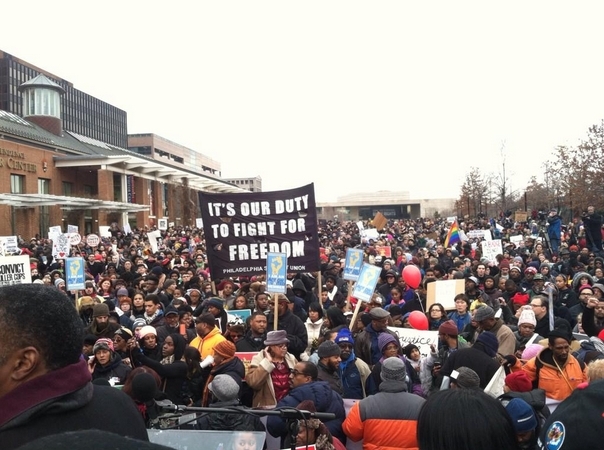 On January 19th, 2015, an estimated 10,000 people gathered in the streets of Philadelphia to #ReclaimMLK. The march was organized by the MLK D.A.R.E (MLK Day of Action, Resistance, and Empowerment) coalition. This coalition is made up of faith leaders, labor unions, parent groups, college and high school students, and grassroots activist organizations. The “MLK D.A.R.E.” coalition was born out of the Black Lives Matter protests in Philadelphia. Members of more than 2-dozen organizations wanted to do more than just march and “die-in,” so they started talking about how they could collaborate, and use their collective voice to effect change. The “MLK D.A.R.E.” coalition formed and developed a list of demands that center around justice, jobs, and education. They are calling for: an end to the use of “Stop and Frisk” and an Independent Police Review Board that is fully empowered and funded; a $15 per hour minimum wage and the right to form unions; and a fully funded, democratically controlled local school system. Hi I’m Rodney Burney and I go to Murrell Dobbins Technical High School and also a member of the Philadelphia Student Union. Happy New Year to everyone. What is it, 1963? No? Well, that’s weird because the same problems that have been going on in the 1960s are still going on 2015. Dr. Martin Luther King had a dream and we are here as black youth to stand up and make the dream come true. Are we going go to keep letting the police kills us? Are we going to let the government take away our freedom? This is not a dream it’s a nightmare! Do we want a change? Do we not want justice for all of our brothers and sisters we lost? Dr. King said we as a people will get to the Promise Land. Well here’s my promise land. I see black people in better houses, not the projects, but nice neighborhoods. I see kids playing in a hot summertime with water guns and sprinklers all around the neighborhood without being afraid. When the community police ride by, they just wave and let them be on their way. I see us as a whole, working together to make something bigger and better, not keeping to yourself. I see, in my paradise, full funding for our schools everywhere and more schools. We would raise the salaries of our teachers, counselors and nurses because they deserve it and their very important job is our education and safety. I also see more black owned businesses. We need more and better job opportunities for young people. I’m not just talking about the people who graduate from the best high schools. I’m talking about better job opportunities for the graduates of Benjamin Franklin, better job opportunities for the graduates of Strawberry Mansion, better job opportunities for all public high schools all over. And I see us working and fighting together and not fighting each other. And you what else, I see no more war! Does anyone knows how much they spend on war? Not millions. Not billions. TRILLIONS! Does anyone know whar all that money can be used for? School funding and to build more schools, more and better paying jobs for everyone, more housing, more healthcare for all people, everything would be so much better! The violence we see is not just in war though, it is the denial of these resources, jobs, housing, education, safety, to Black, the poor, the immigrant communities. It is the denial of these resources to all people. It is the closing of our schools. It’s the policing of our communities. That is state violence. The state is violence. And we will not be silent. These are all the things we need, all the things we deserve! And to get the things we deserve we have to fight together, recruit together, build together, stand together, stay together, fall together, get back up together, make improvements on the plan together, see what went wrong together, so the only way we can win is if we do this together. Dr. Martin Luther king had a dream y’all lets make it come true. Post by BlackBoard Labs Inc.